The 53” Easy Ride Residential Wheelchair Platform Lift to improve access to raised entries, porches or short decks. For affordable solutions to accessibility, our residential wheelchair platform lifts are user friendly and easy to install. For indoor or outdoor use, Easy Ride wheelchair lifts have a sturdy, durable weather resistant design. For a safe, smooth, economical choice to gain easy wheelchair access to your home, Freedom Lift Systems have a compact footprint to fit renovations more easily. 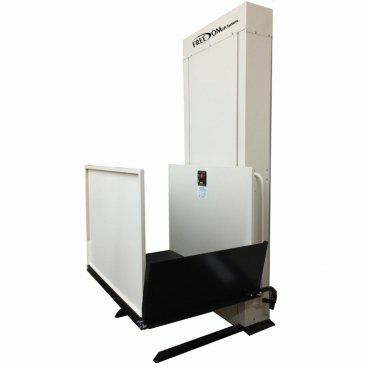 Our residential wheelchair lifts meet ASME 18.1, section 5 requirements for Private Residence Vertical Platform Lifts. Non-skid platform is 36" x 48"